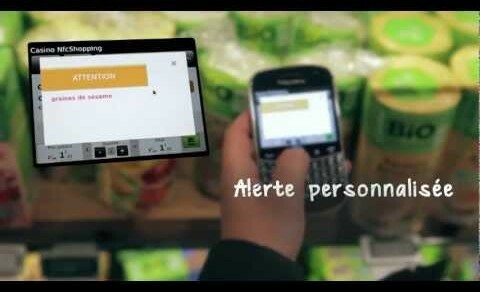 French supermarket chain Casino Group has launched an NFC mobile application designed to streamline the in-store shopping experience. Developed alongside NFC specialist ThinkandGo, the mCasino app enables shoppers to tap NFC-tagged items with their mobile phones to add them to a virtual shopping cart, as well as receive any discounts, coupons, or other information about the product – e.g. ingredients, nutrition facts, price – embedded in the tag. When the customer is ready to check out, he simply taps his phone against an NFC reader to complete the transaction and earn points on a loyalty card included in the app. Casino Group employees are testing the service ahead of a full roll out in October at the Casino Supermarket Shopping Centre des Belles Feuilles in Paris, followed by another supermarket in Lyon. Casino Group has big plans for mCasino going forward, including NFC-enabled home shopping as well as on-the-go shopping using NFC tags in transport hubs and other busy areas. This fall at the Centre des Belles Feuilles, the company will also launch a giant “Casino Digital Wall” screen that acts as an interactive product catalog, allowing users to add products to a shopping cart and transfer it to their mobile phone for checkout.